If a student walks into a United Voices Gospel Choir (UVGC) rehearsal, they will find choir members circled together trying to find their notes. UVGC President Olamiposi Owolabi, or Olami for short, can be found throughout the Humanities 301 choir room attending to one piece of business after another. 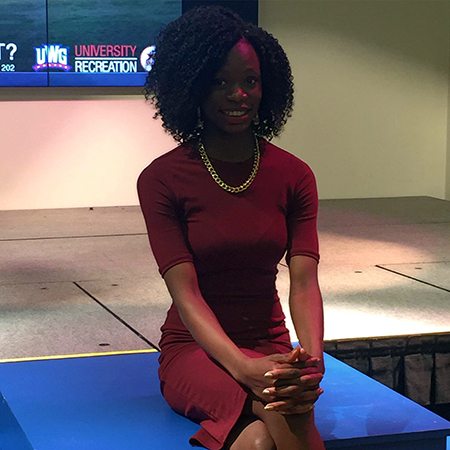 Besides her administrative duties, Owolabi also serves as a mentor to all those who call UVGC their second family. Originally Owolabi grew up in Nigeria as a student at an all-girls boarding school. When Owolabi came to the United States with her family in 2009, adjusting to a new culture and a new place proved challenging. It took her about a year to find a sense of normalcy. One aspect of her life that has helped her to get through the transitionary periods is her faith in God. Anyone who has any familiarity with Owolabi can tell she is a very spiritual person. Her strong sense of faith led her to become UVGC president, as well as an active member of Bethel Campus Fellowship. She describes her path to leadership as unexpected, as many other viable candidates for various reasons could not take up the role. Thus the honor landed in her lap. She has taken the position in stride, having already served on UVGC’s Executive Board in the past. Music brings color to the lives of many people around the world, including Owolabi. She sings as an alto in the choir, the section of a choir traditionally devoted to women with lower voices. Though she does not direct the choir, she helps to make sure that all other aspects of the choir’s agenda are taken care of, such as funds and dates of workshops. Given her compassion for people, it makes sense that she is on track to graduate with a degree in nursing after the spring semester in 2016. Surely she will bring her all her knowledge of mentorship and spirituality to whatever career path she chooses. She will leave a sizeable hole to be filled in the governance of UVGC. I was fortunate enough to teach Olami in my Honors Anatomy class at Wheeler HS, shortly after she came to the States. She was a delightful, extraordinary young woman….and I am happy to see that nothing has changed!